Do you want to radically start changing your life? Yes? Then pay close attention to these things whether or not you hold them against yourself, or against others. This whole idea started for me when a wise woman I met last year in Ohio told me to stop using words like "should" and "need" as they were unhelpful judgments against ourselves. (That we haven't yet done this or that.) 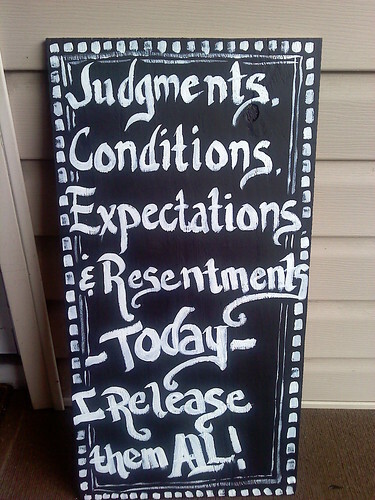 She suggested I declare, "Today I release all judgments past, present and future." Boy oh boy, did that ever click into place. I'm not saying that I don't still falter but when you become aware of the habit, pattern or behavior you wish to change, you are already on the path to change it. Hanging out with these Judgments, I found a few of its siblings: Conditions, Resentments, and Expectations. Why not toss them all out the window? I really don't need any of them. Seriously. I just want to make clear that I am not speaking of any kind of actions surrounding forgiveness because that's a whole different discussion for another day. All I'm suggesting is that you abandon self limiting behaviors which arise in the form of judgments, expectations, conditions and resentments. Have you read this post? If no, now might be a good time.